Home » april fools , rock band , rock band weird al yankovic , video games , weird al yankovic » ROCK BAND: "WEIRD AL" YANKOVIC coming October 27th! ROCK BAND: "WEIRD AL" YANKOVIC coming October 27th! We already knew that ROCK BAND 3 is scheduled to retail later this year... but I am already drooling about this one even more: Rock Band: "Weird Al" Yankovic has just been announced by Harmonix and MTV Games! It'll publish on October 27th, just over seven months from now. Harmonix and MTV Games is proud to announce ROCK BAND: "WEIRD AL" YANKOVIC is in production for a release date of October 27th, 2010. The latest in the popular Rock Band series of music and rhythm video games, ROCK BAND: "WEIRD AL" YANKOVIC is a homage to the unique character and career of "Weird Al" Yankovic: the best-selling comedy musical artist in history. Much like last year's critically acclaimed and commercially successful ROCK BAND: THE BEATLES, ROCK BAND: "WEIRD AL" YANKOVIC will take the player on an interactive journey across Yankovic's phenomenal career which has spanned four decades and counting. The game begins with a seventeen-year old Alfred Yankovic recording original songs on a cassette player in his bedroom at the home of his parents in Lynwood, California to submit to Dr. Demento's radio show. Other stages of the game will take place in fully-rendered reproductions of the men's restroom across the hallway from the radio station at California Polytechnic State University, a Japanese variety show, and Al's now-infamous 1987 performance at the Cowcatcher Calamity Festival of Lizzard Lick, Nebraska. ROCK BAND: "WEIRD AL" YANKOVIC will also include sections inspired by Weird Al's famous music videos, beginning with "Eat It" from his 1984 album "Weird Al" Yankovic: In 3-D. Reaching 1988 will give players the opportunity to perform in Weird Al's custom-tailored "Fat" costume within a reproduced virtual set of Michael Jackson's "Bad" video. There will also be playable songs with videos that have never been produced before. "'Albuquerque' will challenge the players' sanity like no song in ROCK BAND history," Weird Al confidently predicted, speaking of the nine-minute long song from his 1999 album Running With Scissors. In addition to on-screen versions of Yankovic himself, ROCK BAND: "WEIRD AL" YANKOVIC will feature the likenesses and actual voices of Jon "Bermuda" Schwartz, Jay Levey, Jim West, Rubén Valtierra, Dr. Demento, Jay Levey, Victoria Jackson, Harvey the Wonder Hamster and several other legendary personalities from the Weird Al mythos. As players work their way throughout Weird Al's career, they will be able to customize Al and his band with a variety of costume choices such as Hawaiian shirts and hundreds of pairs of Vans shoes. Among the game's many surprises, unlocking the "Jedi Knight" costume will enable players to perform the Yoda Chant at the end of the final concert. 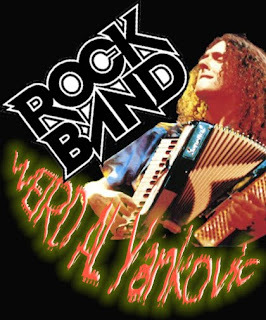 In unprecedented collaboration with an original artist, Harmonix is working alongside Weird Al to create a special accordion peripheral for ROCK BAND: "WEIRD AL" YANKOVIC. Players will have to coordinate finger movements along with using the accordion controller's pneumatic system in order to produce the proper music. The game can also be played without the accordion controller. ROCK BAND: "WEIRD AL" YANKOVIC will be available as a single game, as a game with accordion controller, and as a special "Al and the Band" bundle with game, accordion controller and the standard ROCK BAND instruments. Pricing is not available at this time but is expected to be comparable to other ROCK BAND products. I will gladly pay good money, sell my spleen, betray my Scoutmaster, do ANYTHING to get my hands on this game when it comes out. Heck, I might have to camp out a week in advance for it, just to show my devotion and lust for this! October 27th can NOT get here fast enough!! !